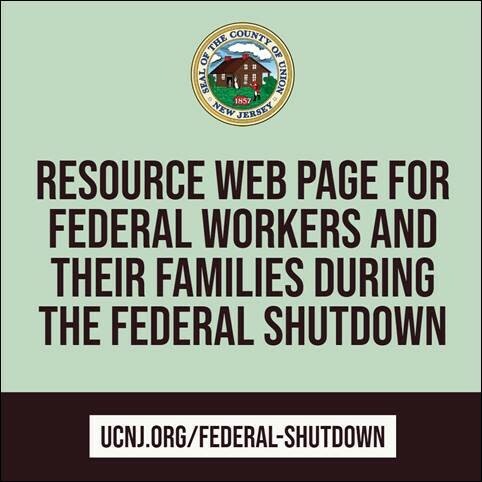 The Union County Board of Chosen Freeholders today announced an online assistance guide for Federal employees who are experiencing hardship due to the prolonged government shutdown. The guide can be accessed at www.ucnj.org/federal-shutdown/ and contains location information on food pantries, soup kitchens and diaper bank sites; County drop-off box locations for those wishing to donate diapers, and feminine hygiene products; SNAP information; a donation link to the Community Foodbank of New Jersey; and a list of nationally-known businesses offering federal workers relief, including free meals, restaurant discounts to deferring payments and zero-interest loans. There are approximately 460 Federal employees who live throughout Union County, according to the most recent information available from the Census Bureau. Offices are open 9 a.m.-5 p.m. Residents who receive assistance through the SNAP Food Assistance program received allocations for January and February earlier this week. Recipients are urged to budget their funds as the dollars credited to the cards must hold them over for two months rather than one, as is the norm. Federal employees not receiving SNAP, and who need the assistance can visit the web link on how to apply for benefits during the shutdown.